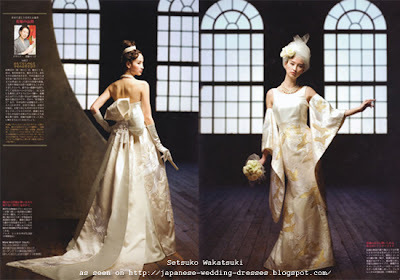 While we're on the topic of kimonos, I thought I'd show you the genius work of bridal fashion designer Setsuko Wakatsuki.who is known for remaking heirloom kimono fabric into modern, Western-style wedding gowns. Kimono remakes are popular these days, which isn't at all surprising since the garment plays a huge role in Japan's history and it's only natural that young women don't entirely want to let go of their cultural heritage while embracing the contemporary style of dressing. 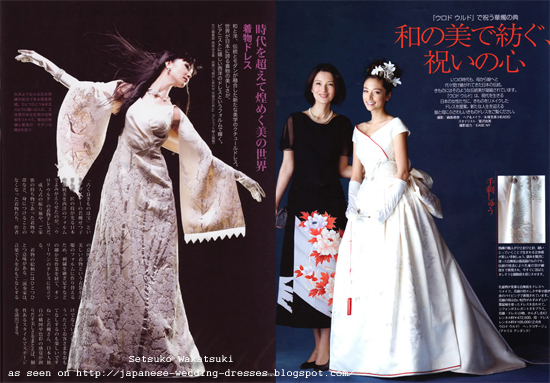 When it comes to modern Kimono dresses, Setsuko Wakatsuki's designs come to mind because she beautifully infuses traditional kimono elements into her Western-style gowns - be it through the use of kimono fabric or through incorporating traditional kimono-style stitching and folding techniques into her work - resulting in a wonderful marriage of East and West. 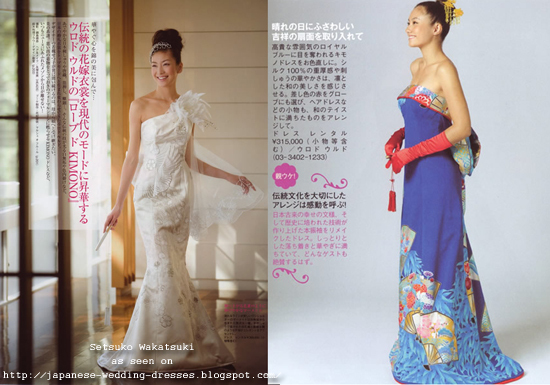 Modern kimono gowns featuring a mix of contemporary and traditional elements: note the obi sash knot on the first gown and the flared kimono style sleeves on the gown on the right. 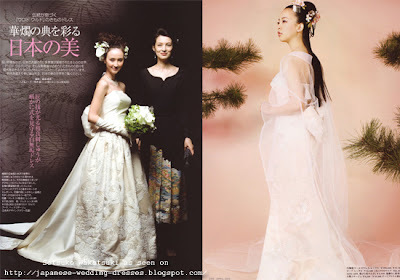 Western-style wedding dresses (and a mother of the bride dress) with kimono-inspired details. More takes on the modern kimono wedding dress. See more of Setsuko Wakatsuki's designs on her website.